Select “AM” or “FM” on the “Select Audio Source” screen to begin listening to the radio. Tune in to the desired station using one of the following methods. Press the “<TRACK” or “SEEK>” button. The radio will begin seeking up or down for a station of the nearest frequency and will stop when a station is found. Select the desired preset station. Search for desired stations by turning the “TUNE·SCROLL” knob or pressing the “<TRACK” or “SEEK>” button. 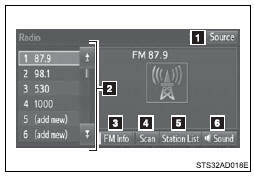 To change the preset station to a different one, select and hold the preset station. Select “OK” after setting the new preset station. Select “Refresh” on the “Station List” screen. To cancel the refresh, select “Cancel Refresh”. ●The radio antenna is mounted inside the rear quarter window. To maintain clear radio reception, do not attach metallic window tinting or other metallic objects to the antenna wire mounted inside the rear quarter window.